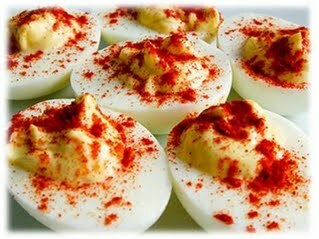 Deviled eggs are the perfect side dish that can be paired with any of our smoked recipes. Eggs are a healthy, protein-packed food that come from chickens. Are you tired of just whipping these up in the kitchen and letting the them just taste like mustard mixed with a hard boiled egg? If so, this recipe will add a little Cajun spice and a little smoke to make this classic side dish come alive. Fire up your smoker to 200 degrees and let it get warm. Put your eggs in an empty sauce pan. Fill the sauce pan with water so eggs are completely submerged. Put the sauce pan over medium-high heat until it boils. Then turn off the burner and cover the pan with a lid. The eggs will continue to cook in the warm water for the next 12 minutes until cooked inside. Once the water has cooled, take the eggs out and peel the shell with your hand. Put your whole eggs into a foil pan which will prevent them from falling through the grill grates or rolling around. Put the foil pan on the smoker for 45 minutes to flavor the eggs with smoke. Cut the hard boiled eggs in half and scoop out the yellow yolk with a spoon. Put the yolk into a bowl along with Miracle Whip, Cajun seasoning, Tabasco, and salt and pepper and combine all ingredients thoroughly. Leave your Paprika out of the bowl as it will go on as the final step. Put your mixture back into the holes in the eggs and then sprinkle Paprika as a topping.